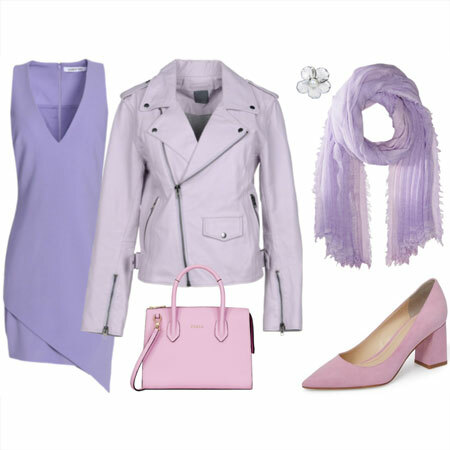 A scarf, a handbag and pair of booties that can be worn together is an easy way to pull together an outfit for Autumn. That’s why I call the combination a “complement”. Add the scarf-bag-bootie complement to the simplest of ensembles and it instantly adds flare, personality and pop to your look. I’ve created two complements around different colour palettes and dress codes. Adding in simple pieces that provide the backdrop to the complement is all that’s left to complete the outfit. 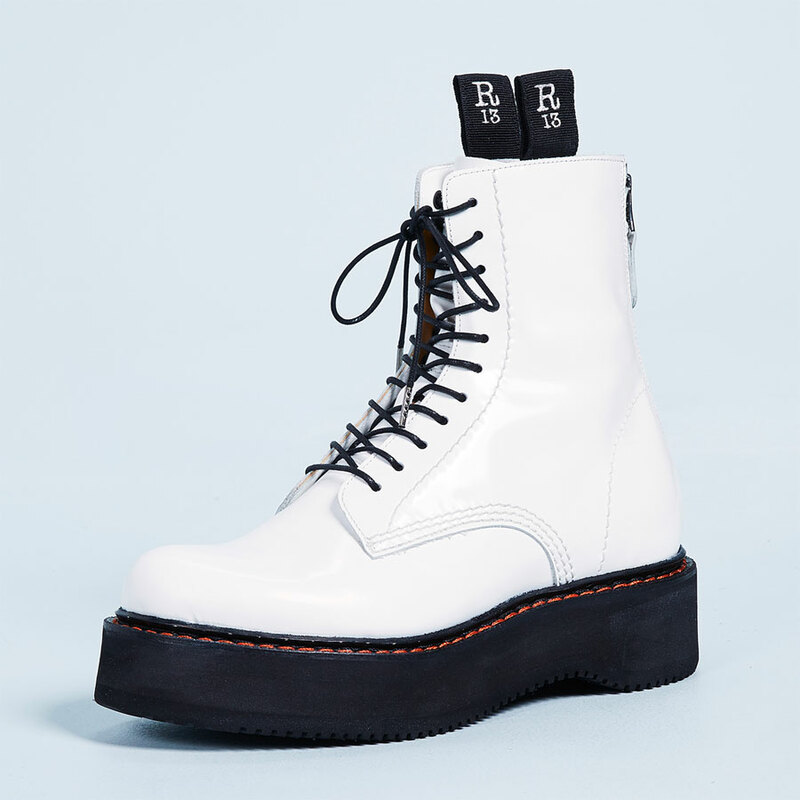 I’ve chosen a black and white patterned scarf, black studded crossbody bag, and — as a nod to this season’s Space Age trend — silver Dr. Martens boots. 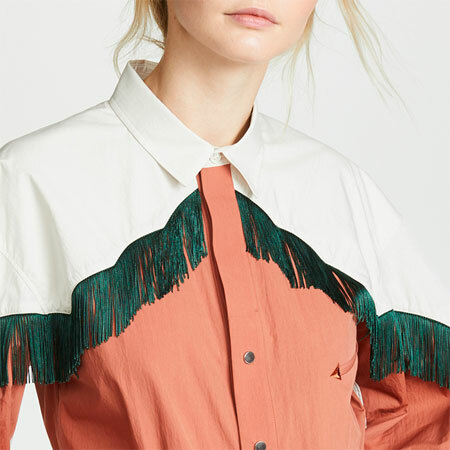 Wear this complement over a long sleeved t-shirt or scoop neck blouse with jeans or cropped pants. Wear it over a casual dress. Or a V-neck sweater and denim skirt. I’ve chosen a lace printed scarf in spice tones, an on-trend, small animal printed bag, and high heeled colour blocked booties. Wear this complement over a blouse and pencil skirt for the office. Wear it over a sheath dress. 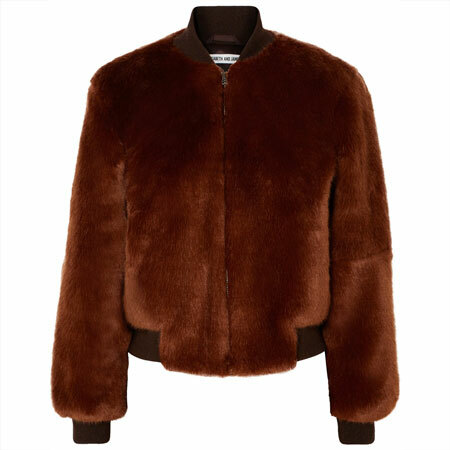 Wear it over a fitted or oversized sweater and tapered trousers. Or dress it down with a tee and jeans. Choose a scarf-bag-bootie complement that’s in line with your colour and style preferences. Choose solids, patterns or colour blocked items. Some complements will be dressy and others will be casual. The complement can also be thought of as a small capsule because the items work together, AND because they can be worn with different “backdrop” outfits. Pack a scarf-bag-bootie complement for short trips and merely change out the backdrop outfit each day. You’ll have an assortment of pulled together looks for your trip that will probably fit into a carry-on size bag. I love that bag in the first outfit complement. Oh my goodness! Those Docs are just fabulous. I want them! I have no idea if they work with my style, my wardrobe…I just want them:). May need a few minutes before I can peruse the rest of the post. This is a good idea! I have never thought about it in this way, but I guess I do this subconsciously when packing. When at home, though, I’ll admit that the bag is usually an afterthought (in many cases, it’s actually “just grab the one that my stuff is already in”). I would go for the second because I spend most of my time at work and the second seems to be more appropriate for work! Brilliant, Angie! Instead of worrying about always bookending my hair with my booties, maybe I can bookend my booties with scarves! 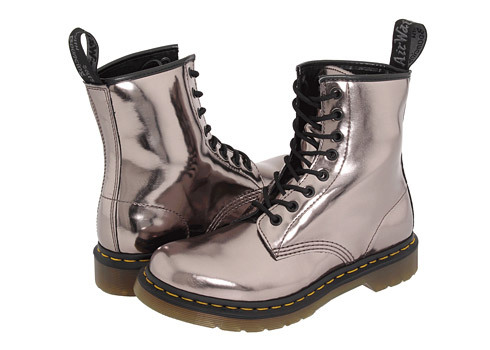 These silver Dr. martens are right up my alley!! Gorgeous combination for some quality time outside in the fall!! Like Sarah said, this is a simple way to bookend – I love it! I don’t carry a bag much when I travel, but the scarf + booties complement is a wonderful, workable idea. Scarf-Bag-Booties…my three favorite words! I like both combos here though I’d go for a larger bag in the second. This is such a great idea, Angie. Thank you SO much. It helps me think a bit more clearly about how to tie outfits together. And since this coherence thing is awfully big in my “happiness quotient” I am going to ponder it some more! Wow – why didn’t I ever think of this “trio” before? Thank you for showing us a way to bring cohesion and style to any simple outfit. Scarves are something that totally mystify me and frankly, almost intimidate me because I really don’t know what to do with them. Maybe I need to try this out…LOVE that second earthy/spicy tone combination! I often wear scarves and acknowledge the power of a scarf to really change up a look, but this post really sums it all up. And I never thought about how much a bag can influence a look. 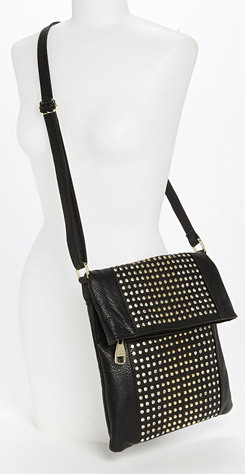 I adore that stud bag in option one! I usually shop for my compliment items as stand alone pieces (ok today purchase a scarf, or shoes) but adding them all together makes a lot of sense! Thanks for the lightbulb moment Angie! I love both and had never thought of creating accessory compliments. I can’t wait to play in the closet with this idea in mind. Thank you! Love the idea and esp. the second one – and I do have at least one or two scarves, but I’m really more on team necklace. I wonder if a necklace is “enough” to help pull an outfit together in this way? Maybe a necklace and a bracelet that tie in with the color scheme? (I don’t wear ear rings and they wouldn’t show anyway). I love this idea. Thanks, Angie! I have many scarves; they’re part of my “signature.” Like Joy, I never thought of creating accessory complements. I’m going to set aside some time over the next few days to play in my closet to see what I can come up with for my own SBB capsules. What a fun thing to do! P.S. I may have to spring for the second scarf – it’s beautiful. It also comes in a beautiful sangria color, plus a few other equally lovely colors. Super way to look at that ubiquitous scarf, handbag, and boot combo that so many of us sport in the fall and winter. I’m with Lisa in always buying these as individual items instead of thinking of them as a combo. One question, though– does this idea work better if at least one of the items is patterned or embellished? Am I correct in thinking that a monotone combo, in a color like grey, cognac, or burgundy, using solid-colored items might not have the same impact? This is super helpful! I laid out my booties and will play around with scarves and handbags later on. I bet I can come up with a dozen outfits using your ideas. Thank you!! One question. How does a belt fit into this equation? Now that I am wearing more boyfriend jeans, that adds another element. Do you pick up a color of the scarf with the belt? Do you ever match the booties? I love both combinations! I’ve got some new booties and scarves for fall, and it will be fun to pair them with my bags. Now, all I need is the cooler weather!! Are you kidding me?? LOVE! Love this! I do it all the time in summer, where simpler outfits and less layering calls for some accessory help. But in the heat it becomes more like sandals – bracelet – bag (or belt). It speaks to the repetition part of my style and helps me to feel pulled together even in a simple tank and shorts combo. Can’t wait to try the fall/winter version when I get back to my CA closet! I don’t wear scarves, but it is definitely useful to bookend a bag and boots! I especially liked doing this with my cognac items in the Fall. I guess in that case, my face/skintone acts as the “scarf” element in the complement. These are great! That first one has my name written all over it! Genius! I love this mini capsule concept. I was doing this last fall without even realizing it. I’m in love with the last example, such yummy colors and patterns all playing together brilliantly. I think I need to add another bag to my collection, your examples are fun and such statement pieces! Scarf-bag-bootie, yes! Three things that I love and have lots of, but I never thought of it just like this–like a FFBO that can be transferred to various backdrops. Clever. Another excellent and helpful idea, plus the examples are great. Now, if fall would only come. Yes yes yes! And how about adding belt into the mix? great idea. I got to think of the necklace ( scarf for me), bootie and bag complement for this upcoming fall/winter. Brilliant! Well this just inspired a whole morning of online window shopping, followed by quick trip to Aerosole only to find the grey “entorage” booties I want don’t seem to be coming to Canada. Boo! Anyway, a great way to think about outfits for fall. But I’m thinking in terms of multiple scarves, so as not to feel like I’m wearing the same outfit over and over (even with different basics underneath). I like the way some are making the complements their own by substituting the items. Fantastic! Gaylene, texture and pattern always adds visual interest. Ombre items are more subtle, and solids will work with textural interest. Laura and merwoman, great question about the belt. I’d probably match it to my footwear in this case, or a colour in my scarf. I love this information Angie! This complement looks like it will elevate my outfits to looking like outfits with style & not just clothing worn to keep me warm. Currently all my booties are black as are a lot of my clothes & bags (boring) but I do have calf & knee high boots in other colors (cognacs, saddles, browns) would they work or do they have to be booties? Can bags be more plain & classic if the color is different to clothes for the pop? I have saddle & brown bags. Do pashminas work instead of scarves as I have a lot of those. Is there a post on how to wear/tie scarves & pashminas? I can never get them to look right. I also never look right in high necked clothing so maybe it’s to do with my rectangle face or broadish shoulders as I have a long neck do that’s not it. Brilliant. 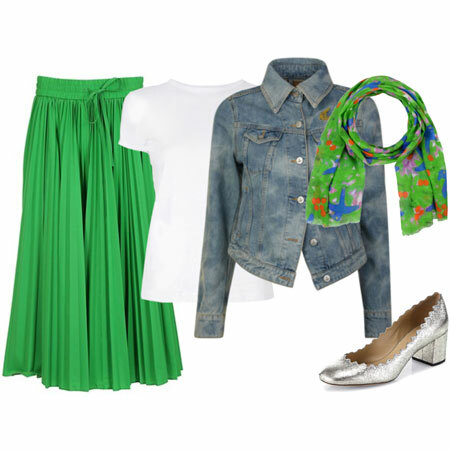 Typically I tended to put things together in pairs: Bag/shoes; belt/shoes; scarf;shoe. I’ll have to try to put together some triplets, so long as I can keep them from getting too matchy-matchy. M black/white tree scarf, black/white oxfords and black/white spectator crossbody could look very good toether… or they might be overkill. I’ll have to try it out! Mmm…loooove that second one. I think I’m going to click and get my cc out a little later! I can totally think of several bases it would work with. 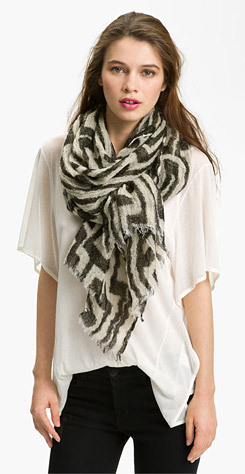 I was going to mention it during my post on the necklace vs. scarf competition, but I love scarves for travel. Besides being an easy layer to take on and off, I was saved the frustration of necklace clasps! Sounds like fun! A great way to make new and unexpected combinations, which is what I find most enjoyable about fashion! Thanks Angie! Aha! This is how I pack when going away in the Spring, Fall and Winter months. It saves a lot of luggage space! What an awesome concept! I love this idea. Elle, taller boots are a fine substitute for booties. It’s hard to make a call on the bags without seeing them in complement action. And pashminas can be worn as scarves. If you search for scarf tying on YLF, you’ll find posts on the subject. What a great post! I am seeing a lot of silver boots/shoes here in London and was thinking if I should get these. This takes me a step closer to my purchase. SBB rocks and I love the first black-and-white combination, especially! I’m really interested in your response to Laura’s questions, because, I have also been wearing my BFs and using belts a bit more now. Yesterday, I “somewhat” matched the belt with the booties, which matched my hair, but I’m wondering about a contrast as when Arya mentioned a bright pink belt as a contrast to her look with her husband jeans in a WIW. You did answer the “belt” question! Thanks. I see it now. Must go look at those metallic boots again. Love these combos and love the idea. This is right up my alley as I have these items in multiples and now am going to focus on mixing and matching. What a great and easy concept. 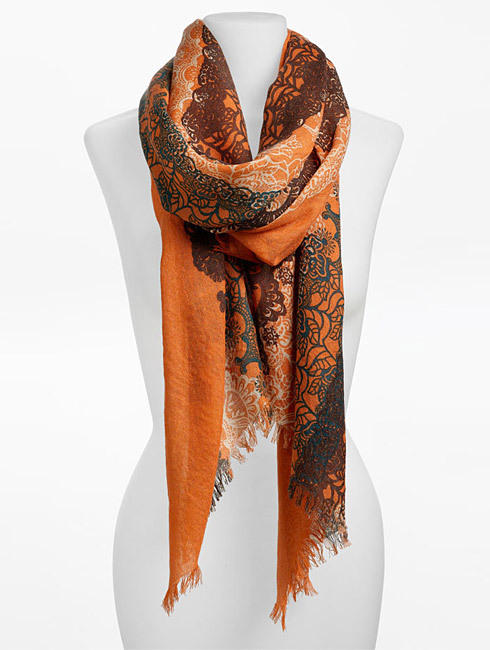 I love both of these combinations…and now I must have that orange print scarf! My mouth just dropped open when I read this entry. So simple and yet so brilliant! I can’t wait to try this out. It is like instant pulled together style, but working from the opposite direction (accessories building the outfit first). Do they have to be booties, though? I am so short I am afraid they look terrible on me. SBB complements are already dancing through my head. A great way of looking at accessories! Like many others I’ve been thinking in ‘twos’ not ‘threes’. Now I think I need a couple more handbags. Oh you enablers…. Neat! I can see how these combos spiff up even the plainest outfit. Love it. And both of these bags are soo cute!! Very, very cute components and a nice way to complement the wardrobe quickly. The Doc Maartens. . .whoa! I miss my Doc Maartens that I recently had to get rid of because they didn’t fit right anymore. Love the idea. Can’t wait to wear “boots” again. I like both the black and white and the animal prints!! I will post some pics of my bags. I don’t want to acquire too many bags due to space requirements so does this SBB complement only work with interesting detailed bags? I can’t post pics here so if it was a british tan flap messenger bag with brass buckle, & the same colored boots with a paisley pashmina in Autumn colors including matching the tan color in the bag & boots? Also if I wore a red bag & scarf with red in it would I have to wear red boots or would black or tan be ok? 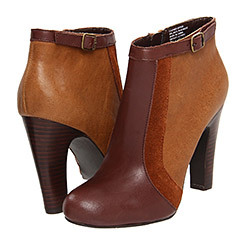 LadybirdK, taller boots or even pumps are a great substitute for booties. Elle, your tan SBB complement sounds like it will work. And black or tan boots would be fine with the red bag and scarf complement. I look forward to seeing your pictures on the forum. Angie, this is such a fun idea! I enjoy making sure my shoes and handbag are related without actually matching, and adding a scarf into the mix to spice things up is brilliant. Having some trios nailed down should make fall dressing a breeze. Thanks for the inspiration and for always allowing substitutions. Great idea! So helpful. Thank you! What a great idea! I was just thinking about how I’ve completely lost control of my scarfs – I think this weekend I will spend some time thinking of, and experimenting, by combining them with handbags and booties _ and hopefully they will fall back into some kind of “order” in my head! Thank you! Wowsers, this is genius! I have lots of bags and scarves and will definitely be trying this out if the weather ever cools down around here! LOVE both of your examples! This is brilliant. Just add jeans! This may become my “fall back outfit formula” for fall. I had let my scarves drift to the back of the closet but the thought of grouping them in trios with bags and boots has reinvigorated me to bring them out again. Thanks, Angie! Love this idea, but I need a bit of clarification. In Angies two examples above, two of the three items had multiple colors. Will this work if only one item is multi-colored? For example, I have a print scarf with shades of black, teal, aqua and gray as a starting point. Can I go for a teal, aqua, or gray bag? Or does the bag and/or booties have to have 2 or more of the scarf colors? Ann in New England, your bag options will work well with the scarf. No need to have more than one of the colours represented in the scarf and boots. This is a great concept, and I really like both examples you’ve shown. In practice I’d say I match all three items only half of the time, primarily because my two winter coats are dark so sometimes I use my purse as an additional color burst. I think I have an easier time “matching” all three when there are more colors in the scarf to choose from, though I do like to match all three more tonally to create contrast with a tonal base outfit. Going to keep this idea in mind!